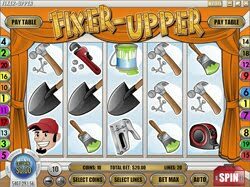 The new slot from Rival Gaming – Fixer Upper is a home improvement themed slot which follows the trials and tribulations of a young couple trying to flip a house. This is a hands-on slot so you will be expected to get your hands dirty and help with the plumbing, painting and getting rid of some uninvited guests that take over your backyard. Watch as the iSlot transforms in front of your eyes from an old fixer-upper into a beautiful home through three rounds of do-it-yourself fun. Spin reels full of tools and paint as you slowly improve room after room of the new house. Players must keep an eye on several icons that deliver big rewards. The first one is the metallic ladder that is wild, thus can be substituted for any other icon of the game (except scatter icons). The wild will multiply any jackpot by the number of wilds in that winning line. Five Wilds in one pay-line delivers nothing less than 888 times your original bet. During Free Spins the wilds multiply wins even more. 1 Wild multiplies the win by 3, 2 Wilds by 4 times and 3 Wilds by 5 times!The second icon to place close attention is the blonde handywoman. She will trigger 15 Free Spins when she appears 3 times in any order during one spin. Four of these icons trigger 30 spins and finally all 5 of these icons triggers 50 free spins!Finally, this game has 3 incredible bonus rounds. Players get to paint the new house, repair the piping and to scare away groundhogs from the backyard. All these bonus round reward the player nicely with serious amounts of jackpot coins.Finally the player choices determine how the “skin” of the slot will evolve. The skin changes according to the decisions the players makes during each of the bonus round.This interactive slot is full of great features for players that love online slots!